TAMT announced at the concert last night the launch of the Junior Music Centre for the under 8’s school children. Funding has been received from John Lewis Music Matters, The Co-operative Community Fund and Old Down Country Park. This is an exciting new extension to TAMT that will enable children to develop their musical skills from the Junior Music Centre through our main Saturday morning music centre and onto the South Cotswold Youth Orchestra. Parents and young musicians should by now have received details of the Summer Tour 2014. This is for members of the Senior Groups (Strings, Wind, AMS) who are in Y6 or above. The tour will be a 5-day, 4-night tour in the last week of July 2014. Staying just outside of Paris there will be concerts both in and outside of the French capital with plenty of time for sight-seeing and a potential trip to Disneyland. TAMC tours are always an eclectic mix of outdoor and indoor fun (with the ocassional concert thrown-in for good measure). They are a great opportunity to visit new places, and spend time with your friends in a musical environment. Parents and players interested in going need to return their forms and first deposits by the end of July this year. If you’ve not yet received this, contact the Trust as soon as possible. Just one more Saturday morning to go now until the TAMC Summer Showcase Concert on June 29th. Final preparations are underway for what promises to be a great concert. There promises to be something for everyone; there’s a choir piece accompanied by our resident chamber string group ‘The Octaves’, some Debussy and Grieg’s Peer Gynt Suite from the Senior Orchestra, along with some Bach, and even some Ray Charles for good measure. The concert will feature the full-strength of the Thornbury Area Music Centre as it celebrates the end of its inaugural year as a charitable music trust. And what a year it’s been, with membership now into three figures. Performing at the concert will be the Senior and Junior Orchestra, Senior and Junior Strings (including the Bach Double violin concerto with soloists Emma and Ruth), Senior and Junior Wind, String Octet ‘The Octaves’, a mixed chamber group, a Junior String Trio, and not to mention, the choir accompanied by strings and recorder. We hope you can join us in celebrating such a successful year, but foremost the hard work and progress of the players involved. The concert is on Saturday June 29th at 7pm at Castle School. There are no advance tickets, and donations will be taken at the door. A big welcome to all the new members who attended the first session of term! It was cold outside, but there were plenty of notes to be blown or bowed inside to keep us warm. If you stood in the corridor you could hear everything from the gentle sounds of a rather topical number from Les Miserables, to Offenbach’s Can Can. There was even a selection of music from Allan Silvestri’s score for the film ‘Back to the Future’. We hope you enjoyed the snowy weekend. The cancelled TAMC session is going to be rearranged for another date – check website / e mail for the latest details. AMS Concert to be confirmed. Many thanks to all the players (and music tutors) who came along to the St Mary’s Centre last Saturday to help raise awareness of TAMT. The Centre manager gave a generous donation for our playing and we managed to hand out a lot of postcards to passing members of the public. It was very cold, but worth it! Many of the passersby admired your playing & enjoyed the Christmas carols. 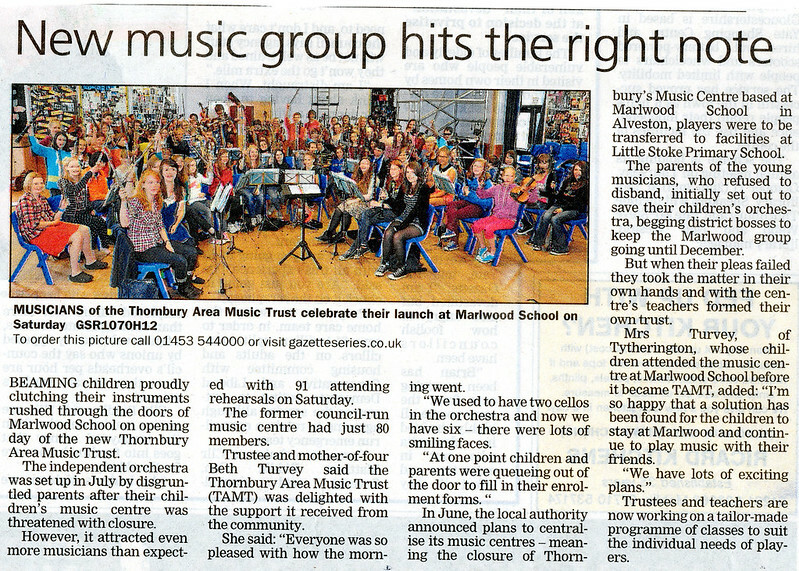 Quite a few have been following the story of Thornbury Area Music Trust in the Gazette. ASDA Fundraising (seniors only) – Saturday 5th December We will be starting to collect funds towards our tour fund at Asda, so if you can make it, please come along at 12 noon – 2pm (Asda foyer) to play Christmas carols. Wear black/blue/white warm casual, but tidy clothes.